Ice on the Moon ? In 1996, a news created sensation. 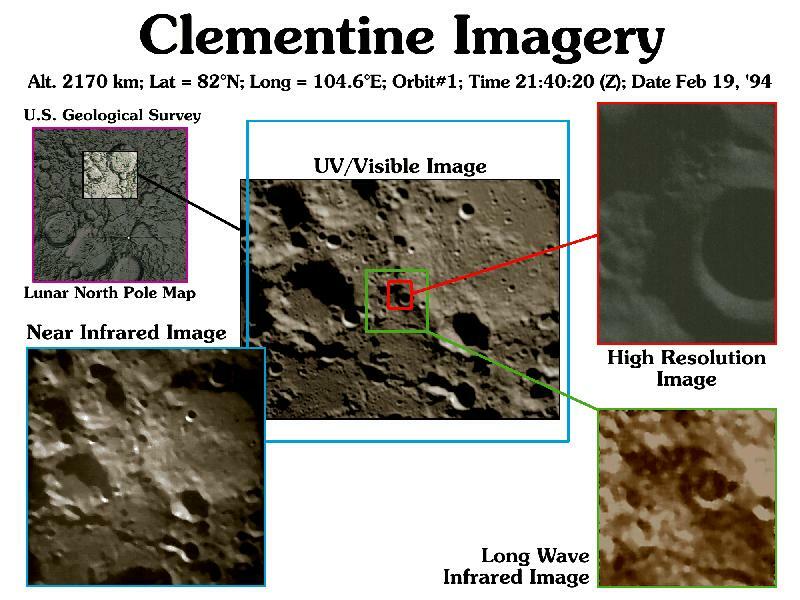 A European probe, Clementine, after an analysis radar (see photo opposite), let believe there would be gigantic quantities of ice hidden under the South Pole of the Moon. According to a dispatch, the researchers spoke of a lake about 25 feet (5 miles) of depth, and some were going even to speak of a lake about the surface of Puerto Rico and depth of 13 kilometers (8 miles) !!! In short, enough to feed a lunar base lasting of the years. But when the results have been published, others enquiring pronounced their skepticism, saying that the probe had flown over the zone rapidly, so the data was weak. Following year, another analysis carried out of Puerto Rico per telescope did not confirm the probe's analysis. In 98, an American probe, Lunar Prospector, confirmed there was hydrogen on the Moon (and thus of strong chances there is watter), but if that's the case, ice would be not concentrated, but scattered. Then, is there watter on the Moon ? To put a term at this interrogation, a new European probe, Smart-1, is used. To know some more, see the corresponding page !